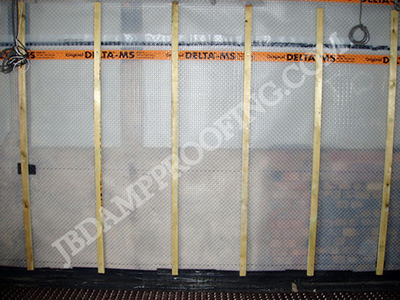 CEMENTITIOUS WATERPROOFING (TANKING) blocks any possible water ingress away from the area. 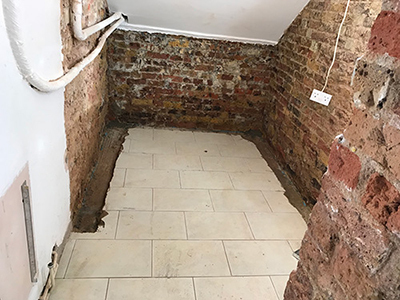 CAVITY DRAIN MEMBRANE guides any possible water ingress into drainage channels and diverts it away to a prepared outlet area. 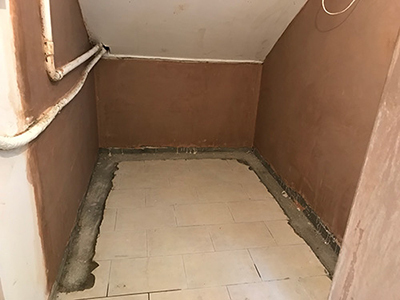 Where there is high water ingress (for example: high water table/hill side properties) the installation of a sump and pump system allows for large amounts of water ingress to be pumped to a prepared outlet area. We provide a 10 year guarantee with this installation. Cementitious replastering or tanking is a technique of applying an mixed slurry waterproofing application directly onto prepared walls and incorporating a floor lap. This application then forms a bond with the masonry causing any water ingress to divert away from the area. A floor lap must be incorporated to form a “tank” system, although with most basement/earth retained areas there are usually windows and doors. This system is not exactly “tanked” it is more “sectional tanked”— which is why it is generally known as cementitious waterproofing. This system can withstand high water pressure and it most suitable for complex structures, where space is limited and does not require the installation of a pump system. 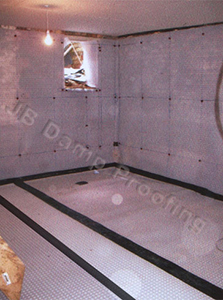 Before & after photo of cementitious waterproofing. A flat lid is then placed over the chamber and can be incorporated within floor coverings to allow for easy access for when a service/maintenance check of the internal submersible pump needs to be carried out. Very similar to having a manhole cover that needs to be accessible but is out of the way. Walls can then be dry lined with an independent frame system, then plasterboard applied and finally a skim plaster finish. Screed or chip-board can be applied to the floor. The prime advantage of cavity drain membrane is due to the independent frame lining system decorating can be carried out straight away, can be applied to painted surfaces and allows pipes/electrics to be hidden behind the system. The sump chamber is manufactured from high density polyethylene and is designed to resist ground water pressure. Either one or two pumps are then fitted. The sump chamber is fitted with two brass non-return valves to prevent water travelling back into the chamber once the pumps have stopped and a gate value for isolation for maintenance/servicing purposes. Dual sump & pump system - two pumps are fitted, one to operate as the main duty pump and then the other to act as a back-up pump. Single sump & pump system - one pump is fitted.